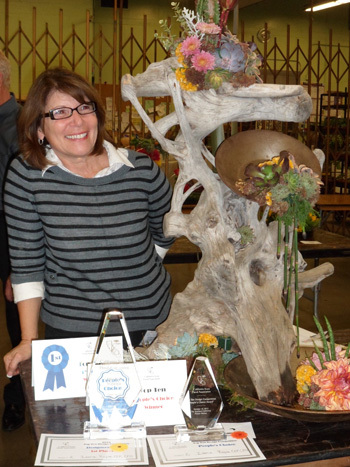 Ivana Royse CFD,CCF, alumnus of the GWC Floral Design and Shop Management Certificate program, received the top honor at the California State Floral Association’s Annual Cali-Flora Top Ten Design Competition – “Legends” on Sunday, October 14th in Los Angeles. Ivana’s designer’s choice arrangement focused on the California gold rush and incorporated amazing varieties of flowers and foliage to create her interpretation of the “Art of the Gold Rush – Panning for Gold”. Congratulations Ivana!! Golden West College was well-represented! Ivana will now go on to represent the state of California in the Society of American Florist’s Sylvia Cup Design Competition in September of 2013. Since 1986 the GWC Foundation has given over $4 million in student scholarships.